A report by the Baltimore Sun showed that Baltimore City experienced an almost 5% increase in traffic accidents from 2009 to 2012. In that four year time period Baltimore City put approximately 50 speed cameras online and issued 1.5 million speed camera tickets. Baltimore's first speed cameras went online in November of 2009. 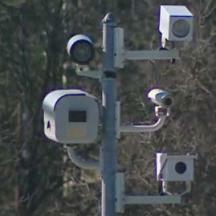 However most of the city's cameras did not go online until months, and 2010 was the first full year with speed cameras. The city defended the program's results by asserting that traffic accidents dropped at six intersections where cameras were used. That data came from only a small fraction of the city's cameras, and was compiled in late 2012 when the city's program was coming under increasing fire over erroneous citations and many other complaints. No data from 2012 was provided. It is unclear why "intersections" were the basis of the city's collision analysis when the cameras involved were speed cameras rather than red light cameras and thus are not necessarily enforcing just in "intersections". Baltimore's program was shut down in early 2013 after hundreds of erroneous citations were sent out to innocent drivers. Is Parking on a Bike Path Legal?